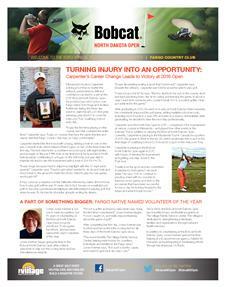 The Bobcat North Dakota Open is a noteworthy example of Bobcat Company’s long history of community involvement. 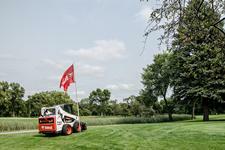 Since 1984, Bobcat has been the major corporate sponsor for the North Dakota Open at the Fargo Country Club, benefiting many worthwhile programs of The Village Family Service Center in Fargo. Through charitable giving, totaling more than $1 million in donations, and significant employee volunteer work, Bobcat is proud to help The Village offers its services to the community. The 54th Annual Bobcat North Dakota Open is a pro-am golf tournament held each year at the Fargo Country Club, benefiting The Village Family Service Center. 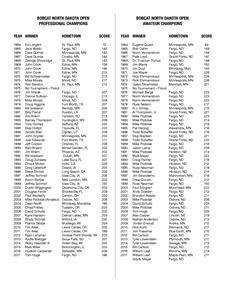 The 2018 Bobcat North Dakota Open was Friday – Sunday, August 24–26, 2018. For the latest news, information and real-time updates during the tournament, join us on our Bobcat ND Open Facebook and Twitter pages. See photos from past tournaments. Learn more about how to become a sponsor. Interested in becoming a volunteer for the event? Learn more about the opportunities available. Read or download last year's newsletter. The Dakotas Tour is a developmental tour that has served as a starting point for many young pros coming out of college, wanting to sharpen their game prior to a shot at the PGA, Nationwide or Champions tours. The Dakotas Tour is a 19-event professional golf tour played in the Midwest states of Minnesota, Iowa, Nebraska, Wyoming, and North and South Dakota. Professional golfers play for a total of approximately $750,000 over the course of a quick nine weeks, starting the week before the Fourth of July and ending the week after Labor Day. The Village Family Service Center strengthens individuals, families and organizations through behavioral health services. Expertly trained counselors improve the lives of those dealing with a wide range of issues – addiction, depression, trauma, debt, unplanned pregnancy, and more. The Village also offers mentoring programs, truancy intervention, an employee assistance program, workplace training, and consulting services. Its adoption services trace back to its founding as a home for orphaned children in 1891. As times change, The Village’s work evolves to meet current community needs. Today, The Village has offices in 15 communities across North Dakota and Minnesota, and reaches more than 80,000 people each year. As North Dakota’s largest manufacturer, Bobcat Company is the world leader in the engineering, manufacture, and marketing of compact equipment, with more than 3,000 employees worldwide. Bobcat® equipment works behind the scenes to help maintain some of the world’s most prestigious courses. Products such as the Bobcat all-wheel steer loader and the Toolcat™ utility work machine are preferred by golf superintendents because of their low impact on sensitive turf.